The spring can be a very stressful time at a fruit farm. While we are busy with planting crops for future years, we are also working on nurturing and protecting this year’s crops. And with over 35 acres of bearing fruit this year, that can be a big job! 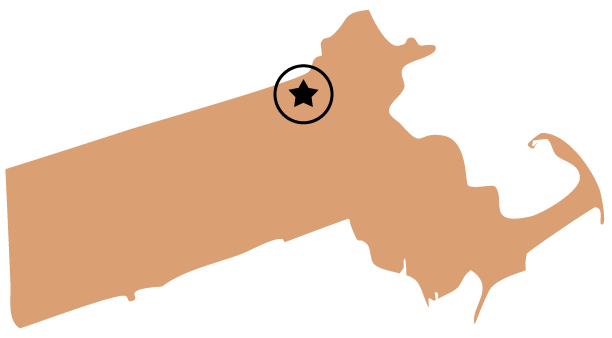 Parlee Farms sits on the banks of the Merrimack River in Tyngsboro, MA in the Merrimack Valley. We have beautiful river bottom soil, but it is unusual to have an orchard in a valley as the cold air settles in low areas. When an orchard is placed on a hill top, the cold air drains down away from the orchard. As a result of our location, we need to have a reliable system for frost protection to protect our crops – apples, blueberries, peaches, nectarines, cherries, and strawberries – from freezing temperatures in the spring. 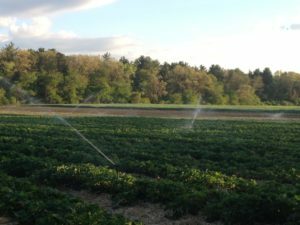 We use overhead irrigation to protect the crops during a freeze event. When the temperatures drop to critical levels to damage the fruit buds, we spray water over them. As the water turns to ice, heat is released. Many people think the ice protects the buds, but it is actually the change of state from liquid water to ice that releases heat and that heat protects the fruit buds from being damaged. To adequately protect the buds, the water application must start before reaching the temperature that damage can occur and continue until the ice melts off the plants. On very cold nights, the process could last 10-12 hours. The critical temperatures for damage depend on the crop and stage of development. We use a chart similar to this one produced from Utah State University as guidance. For instance, apple blossoms in the Full Bloom stage will suffer 10% loss at 28 degrees and 90% loss at 25 degrees. With this information, we would start the irrigation system at 32 degrees to allow ice to form before any damage can occur. We also have to be prepared for freeze issues in the fall. If the temperatures go below freezing before we have completed the apple harvest, we need to irrigate to protect the fruit. If we did not irrigate and the apples froze and then thawed, they could be mushy inside. 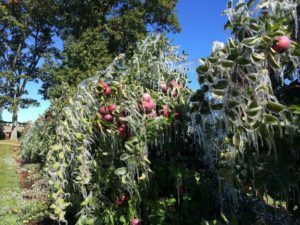 Similar to the spring frost protection protocol, the irrigation must continue to run on the apples until the ice completely melts. Mother Nature dictates if we need to use this system. Some years, we can have multiple freezes and in other years, none at all. In any case, we are prepared!